June 12-16 After two full days to cross the remainder of Oregon and then Idaho we reached West Yellowstone, Montana. 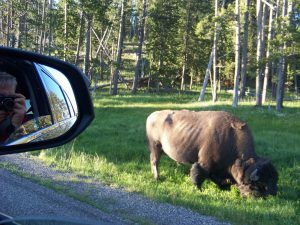 We took advantage of our late afternoon arrival to enter Yellowstone Park at the West Entrance to hunt for bison. We did not have to travel far! 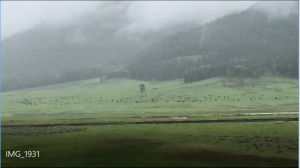 About 10 miles into the park we found a small bison herd grazing along the Madison River valley. The herd was about the same size as the one in Earl and Ethel’s photo, just not at the same location. Our confidence is high that they took their photo along Firehole River about eight miles further into the park. 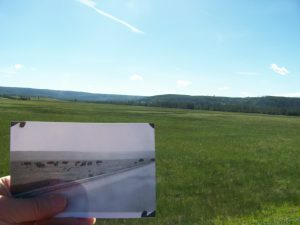 When we got to Firehole though only four single bull bison could be seen and they were grazing on the “wrong” side of the road to a duplicate photo! We counted our blessings though as the next morning when we drove past these same locations there were no bison to be seen anywhere! With still plenty of evening sun left, we drove another 12 miles to try to capture Old Faithful just as Earl and Ethel did. 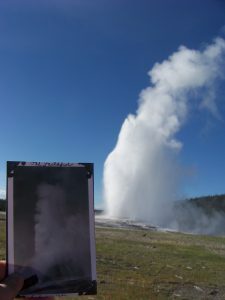 Good fortune was with us as we only needed to wait thirty minutes for Old Faithful to remain true to its name! With our honeymoon photo collecting complete, on Thursday we took time to visit some locations we had not seen on other trips before. 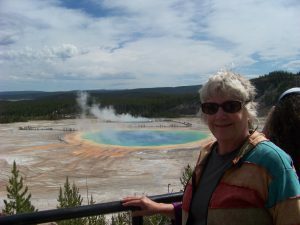 One was Grand Prismatic Spring Overlook which required a mile hike and a 200-foot elevation climb. 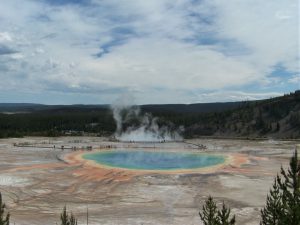 The spring pool is more than a football field wide in diameter and the view was other-worldly gorgeous! Those tiny sticks at the back of the pool are people! 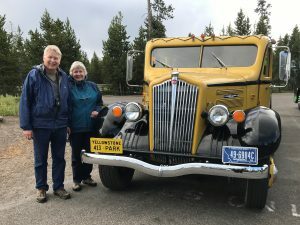 Near Prismatic Spring we spied an old Yellowstone tour bus in the parking lot. 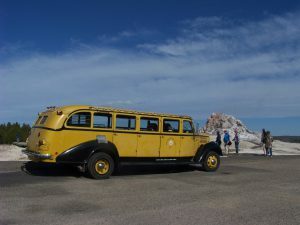 We chatted up the bus driver who said the bus was first put into use as new in 1937. She said it was one of two such re-conditioned buses put back in service for “vintage touring” experiences. Very neat and 30’s! 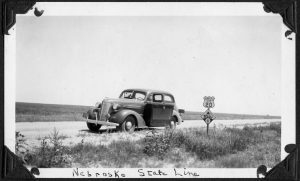 1937 – a good year! 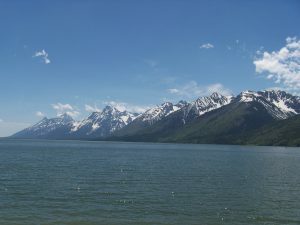 In the afternoon we added another national park to those we visited by heading south 50 miles to Grand Teton NP. With only lakes and no foothills in front of them, this beautiful string of snowcapped mountains seems to shoot right out in front of us. 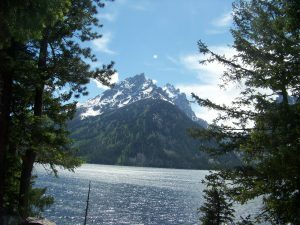 The Tetons are another unique National Park experience different from all the others! 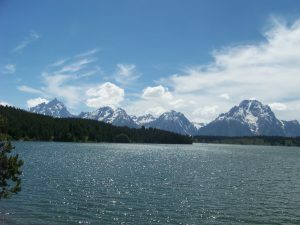 The Tetons looking very Grand! Our plan Friday June 15 was to leave Yellowstone by the Northeast Entrance gate. There are five entrance drives to the park and our Fodors NP Travel Guide recommended the Northeast Entrance as their choice because of its scenic beauty and the best chance for viewing park wildlife. Their recommendation was spot-on on both accounts. 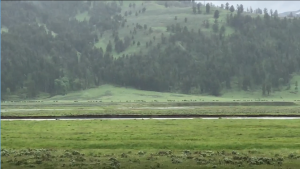 As we traveled up the Lamar River Valley we came upon one of the most incredible life experiences Lynn and I ever encountered. In front of us was a herd of at least 1,000 bison! 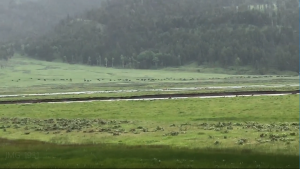 We watched awestruck as the entire herd moved along the river at times in full gallop. As we watched for 20 minutes we could not see the beginning of the herd nor its end. Our Wyoming/South Dakota drop down tab talks more about how truly unique it was for Earl and Ethel to experience the “foundation herd.” We got to see the full bloom of the descendants from the same herd in their picture. Seeing them prosper now from the near state of extinction they were at in the late 1930’s was unbelievable. Three images from a video we made. Those black specs are bison on the run! Each photo shows about a 1/4 mile along the Lamar River rotating the camera to the right. 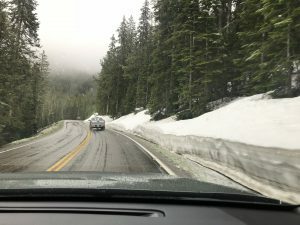 To get to the Northeast Entrance road, we had to first go over Dunraven Pass at about 8,000 feet where the rain we encountered down in the valley was snowing at the higher elevation. That was pretty unexpected too! 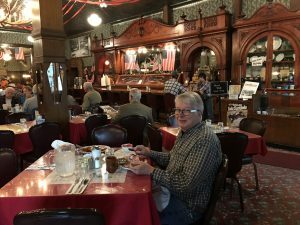 We spent Friday night in Cody Wyoming and ate breakfast the next morning at Buffalo Bill Cody’s historic Irma Hotel. 0ur May 8 blog about Lookout Mountain described the honeymooners trip to Bill Cody’s gravesite. 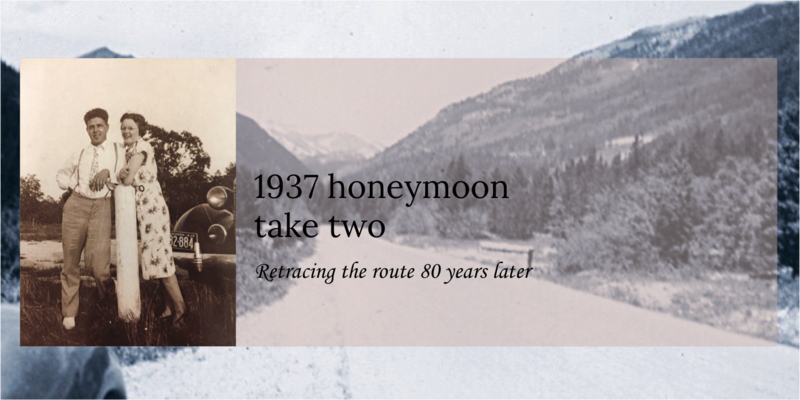 The route from Yellowstone to Mount Rushmore would have taken Earl and Ethel through Cody then as now. Our trip seems to have closed a circle. In our earlier blog, we wondered if Buffalo Bill still had relevance in today’s digital age? In Cody WY, there’s a great museum about his life, his “wild west” shows and Native American/western culture. Cody’s influence can be seen all over the town. 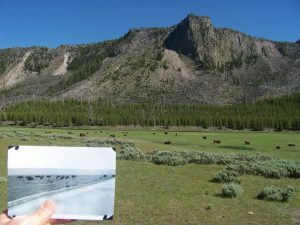 As to his national relevance, we observe that his stature gets reinforced daily for the many Yellowstone tourists passing through the town who stop to do a little extra exploring. 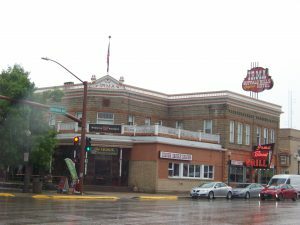 Irma Hotel completed in 1902 and named for Cody’s daughter. Breakfast at Irma’s. The cherrywood backbar was a gift of appreciation to Cody from England’s Queen Victoria. Finally caught up with you…wonderful blog, very enjoyable. Finally getting to finish your blog. Sandy said last Saturday that it was finished. We took Grandma Erma to the Irma Hotel several times. A favorite stop.